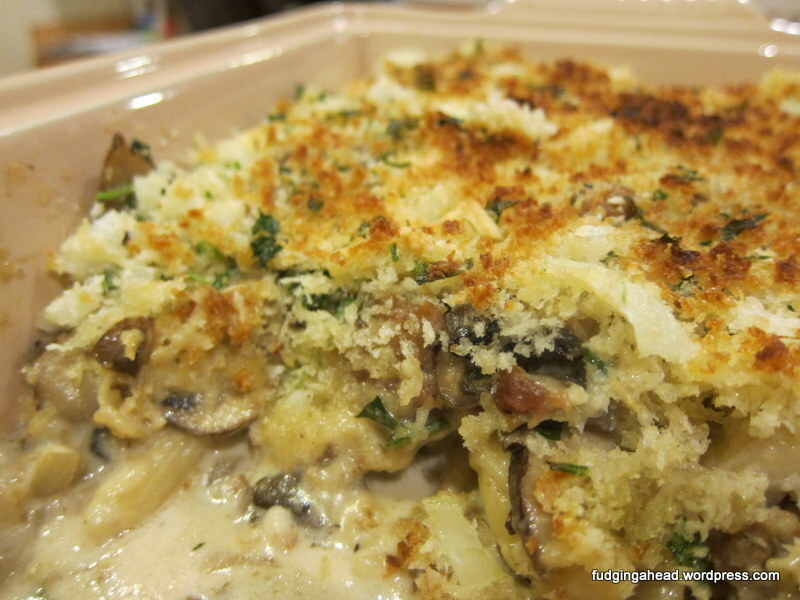 Each ingredient felt necessary, from the cheese, to the shallots, to the parsley. And I often leave out parsley since K doesn’t like it and it is something else I have to buy but this is one of those applications where it works well and K will even accept its presence. Start boiling the water for the pasta, then cook the pasta. 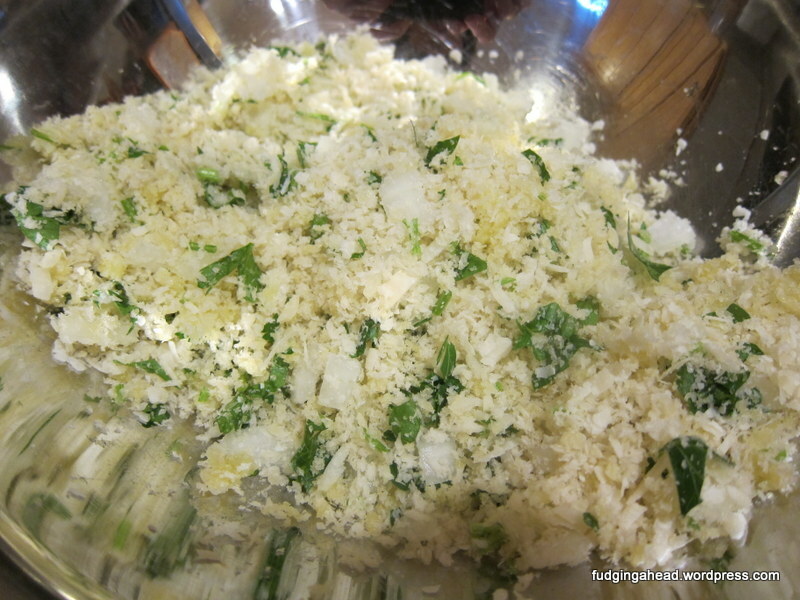 Meanwhile, stir together the panko, half of the cheese, half of the parsley, half of the chives, 1/4 of the shallots, 1/4 of the garlic, salt, pepper, and the olive oil in a bowl. Melt the butter in a large cast iron skillet (I don’t have a large one so I used my Dutch oven) over medium-high heat. When the butter is foaming, add the sausage and cook it until browned (5-7 minutes). 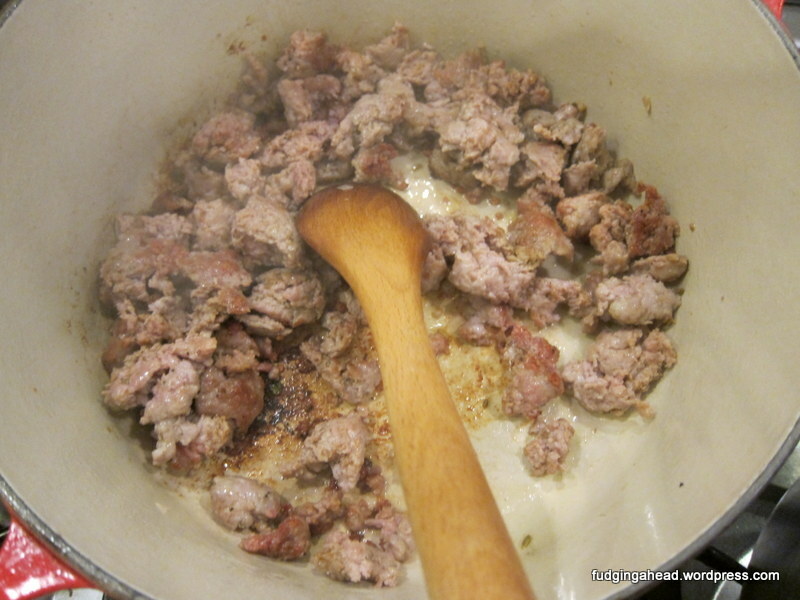 Transfer the sausage to a small bowl, leaving the fat behind. 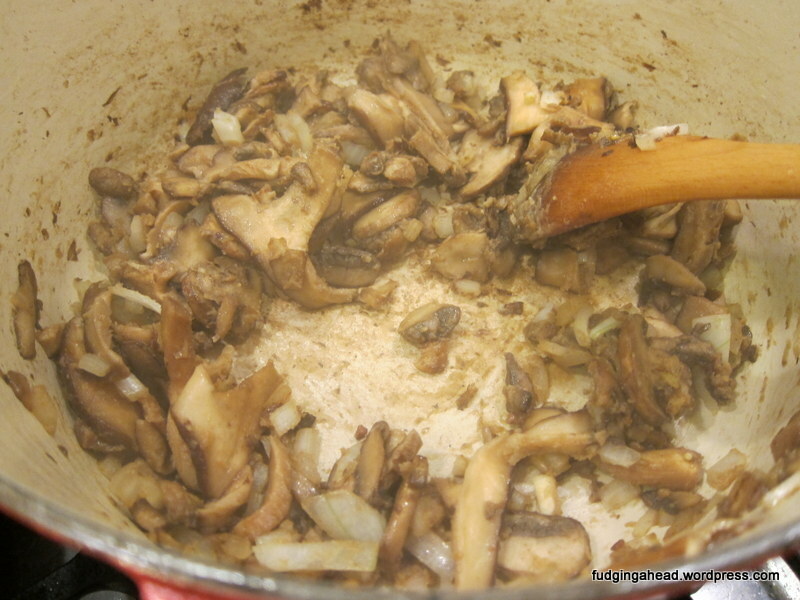 Add the mushrooms and cook until they are well-browned (about 10-15 minutes). Add the shallots and garlic, cooking for 1 minute. Add the soy sauce and lemon juice, stirring. Add the flour and stir, cooking for 1 minute. Whisk in the chicken broth, then the cream. 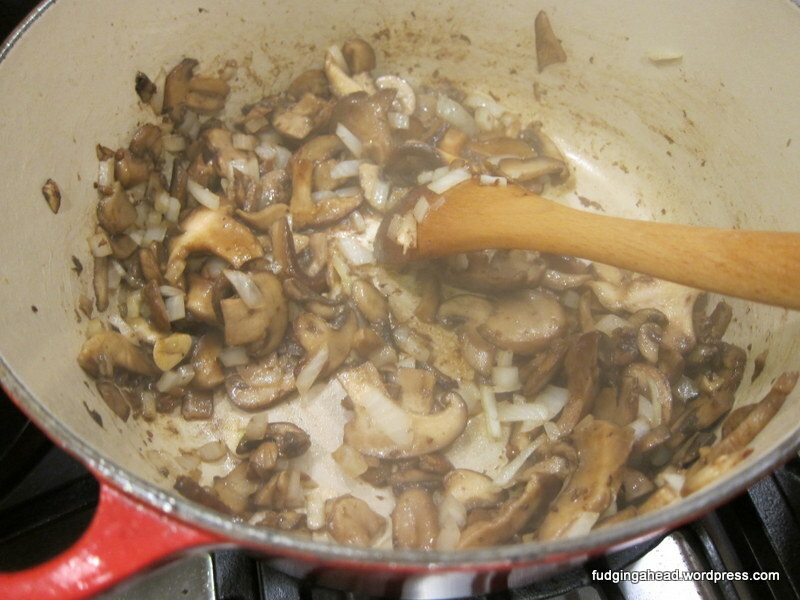 Bring to a simmer and allow it to thicken (about 2 minutes). Stir in the remaining cheese, then the remaining parsley, chives, and sausage. Season with salt and lots of pepper. When the pasta is ready, drain it but reserve 1 cup of the liquid. 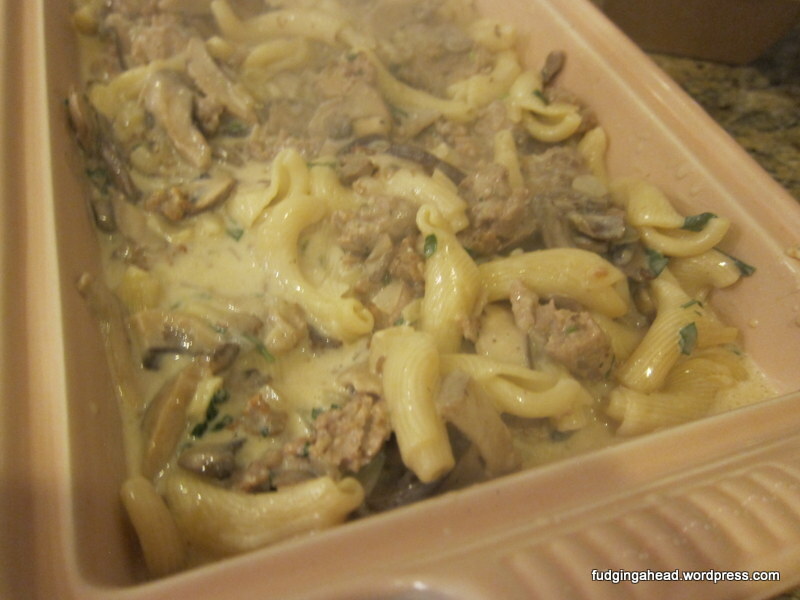 Add the pasta to the mushroom/sausage mixture. Add some of the pasta water as necessary (you want it loose but not like soup). If using a cast iron skillet, just continue. 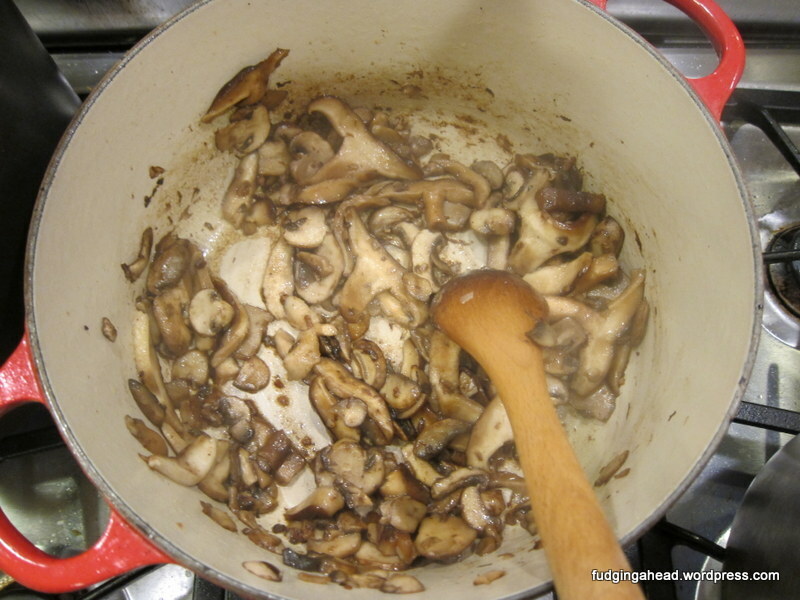 If you’re using a Dutch oven, transfer the contents to a greased baking dish. 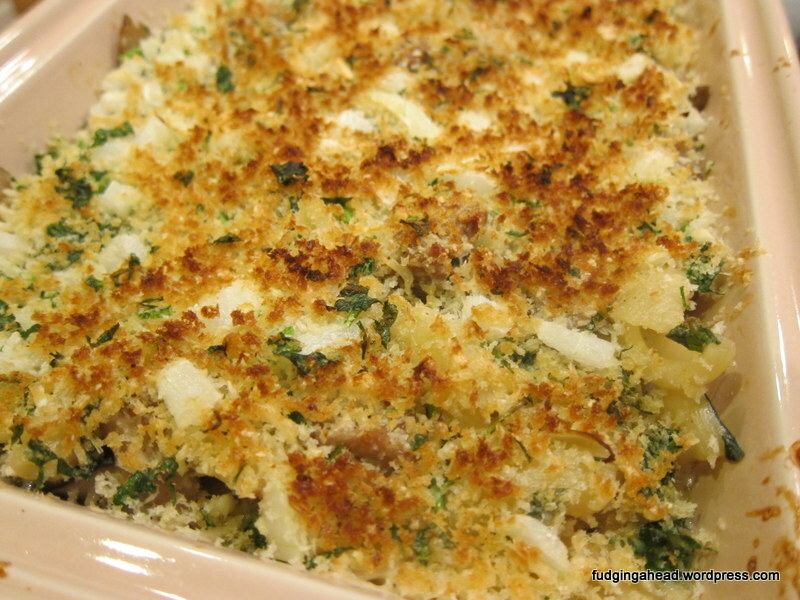 Top with the panko mixture, then broil in the oven until golden brown (a few minutes), rotating the pan to brown evenly. Add the flour and stir, cooking for 1 minute. 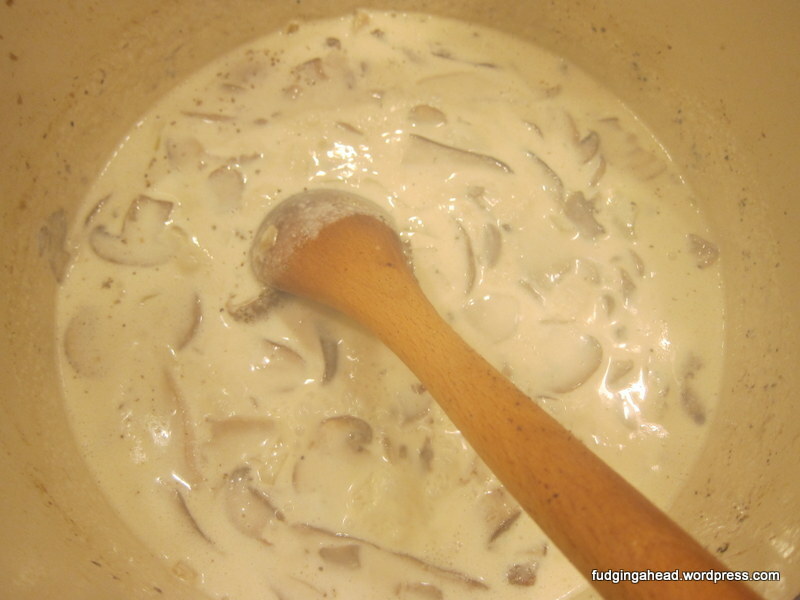 Whisk in the chicken broth, then the cream. 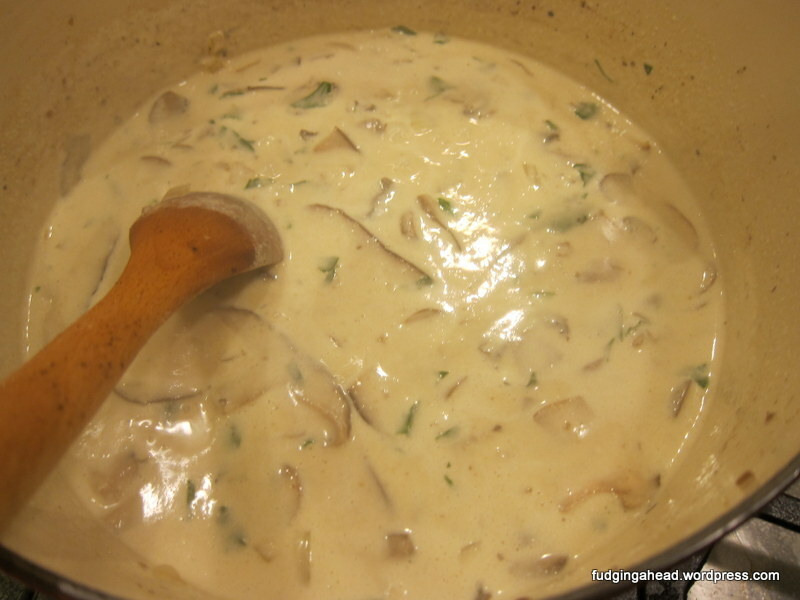 Bring to a simmer and allow it to thicken (about 2 minutes). Stir in the remaining cheese, then the remaining parsley, chives, and sausage. Season with salt and lots of pepper. 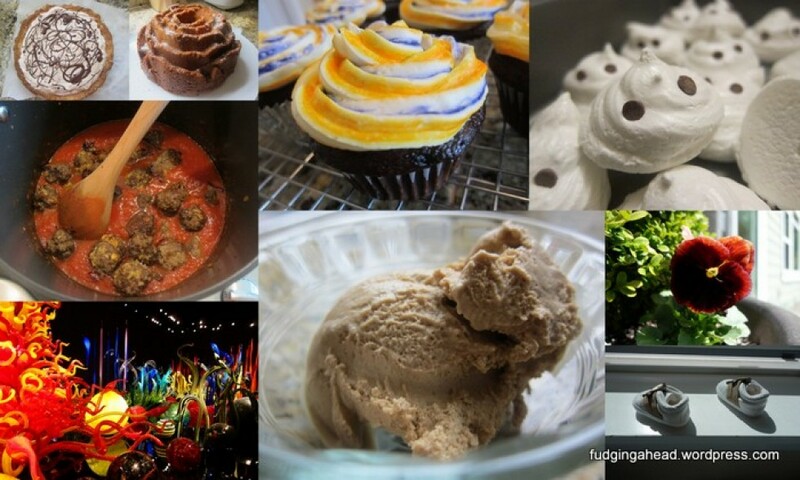 If using a cast iron skillet, just continue. If you’re using a Dutch oven, transfer the contents to a greased baking dish. 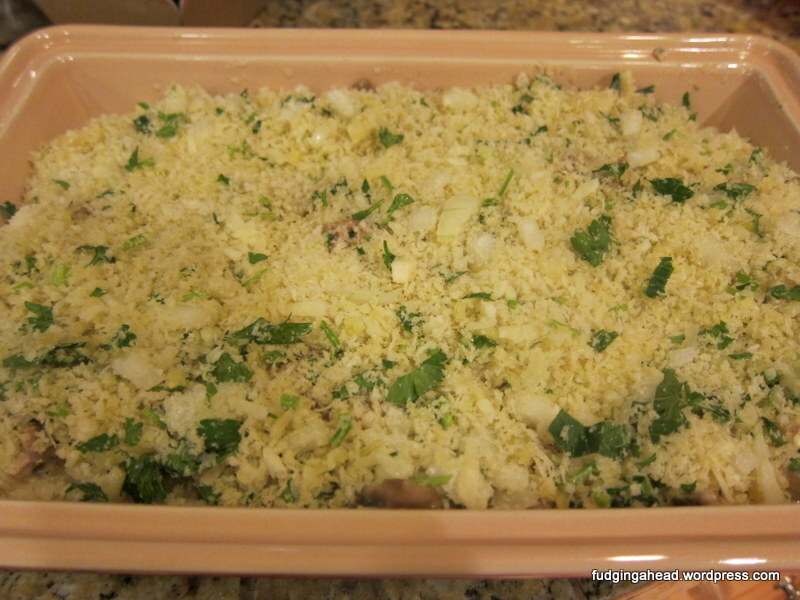 Top with the panko mixture, then broil in the oven until golden brown (a few minutes), rotating the pan to brown evenly.